Download latest version of Avast Free Antivirus, Avast Pro Antivirus, Avast Internet Security and Premier with offline installer. It is the latest antivirus software developed by Avast Software. Avast Free Antivirus is absolutely free for your computer. Avast Free Antivirus will provide you free Intelligent Antivirus & Anti-Malware, Home Network Security and Browser Cleanup. Avast Free Antivirus is very easy to download and install. First of all, download the setup file from the download link given below. This is online installer and provide you the latest up-to-date antivirus program. The installation process will take some time and may suggest you some additional software program. It is up to you to add or reject the additional programs. The online setup of Avast Free Antivirus will start to download latest files for your system. It will take some time and after successful installation, Avast Free Antivirus will be started. It will start a Startup Scan for your PC. 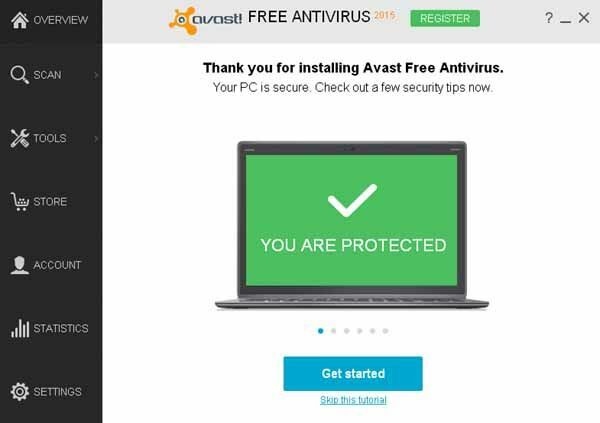 After that, you will see the message “YOU ARE PROTECTED” on the overview of Avast Free Antivirus. It is recommended to register with Avast Free Antivirus. Registration is absolutely Free, so you can click on “Register” button at the top of the Avast window. After registration, you can check your account anytime. Avast Free Antivirus has all items at the left side of the program window. You will see Overview, SCAN, TOOLS, STORE, ACCOUNT, STATISTICS and SETTINGS buttons. From the store, you can purchase or upgrade your Free Antivirus program to Pro Antivirus, Internet Security and Premier. You can use same account for different PCs with Avast Free Antivirus. From the Account tab, you can see the attached PCs and their performance with Avast Free Antivirus. From the SCAN button, you can scan your computer for viruses, scan for outdated software and also scan the network for threats.